This design, from Erika Knight's Classic Knits , is everything I love in a sweater: retro-cute, cropped, simple, soft yarn, 3/4 sleeves. It almost reaches Rowan-style. But why is the neckline so awkward? It isn't just me. 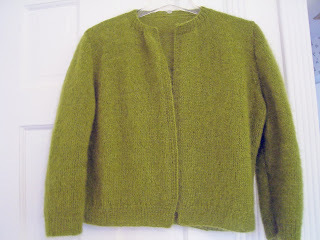 I saw many beautiful Kelly Cardigans on Ravelry and most, if not all, had necklines that hit the model in the wrong spot. I thought the best photo was one where the neck of the sweater was covered by the collar of the dress underneath. Why didn't Erik Knight lower the neckline in front? It would have looked so much better. Of course, if I make it again (and I might), I will attempt to make this adjustment myself. But I am not too sure of myself in neckline alterations. Another alteration I am unsure of is arm hole/sleeve cap. And again, why did the designer make the arm hole so billowy? This shows in the book photo, where there appears to be too much fabric at the sides. My version of the sweater repeats the same flaw even though I am a totally different size and shape from the model in the picture. Despite these problems, I love the sweater. It is incredibly soft and comfortable. One feature that some might see as an additional flaw doesn't bother me. That is the lack of buttonholes. Rather than use snap fasteners as the designer suggested, I just left the front open. Buttonholes in handknit sweaters can be difficult to manage and sometimes ruin the line of the design. I did not want to risk that with this (near) perfect sweater. Thanks for your comments on the Kelly cardigan, especially your warning about the neckline. I, too, dislike high choky necklines, and will alter the front neckline to drop more if I knit this pattern.